At times, do you feel that you are getting more & more addicted to your smartphone and not able to stay FOCUSED? You wake up with your phone by your side and sleep with it next to you. Probably, your phone is your companion throughout the day at all times. But is this PHONE ADDICTION affecting your personal & professional life lately? Are there some Apps which take toll of your productive time & you feel like losing Control? Then we have got a Smart Digital Solution to your problem of mobile addiction! Your Hour app gives you a variety of fun and user-friendly features that can help you track and manage your phone usage and also know the Category of Phone Addict that you are! ★ The Dashboard: Your gateway to your day! The dashboard of YourHour provides you all the essential information you need to know about your day long phone usage. 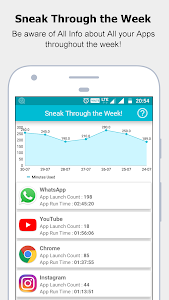 The app keeps a track on your "Total Screen ON Time" & "Total Phone Unlock Count" and thereby, gives a comparative infograph of your past 7-day activity. You can even set a maximum Overall Usage Time & Unlock Counts and once you reach nearby this limit the dashboard changes color. Also, Mr. Slow awaits for you on this board! ★ The Goal Spots: Know Your Level of Addiction! 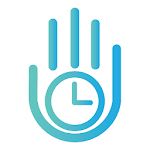 ★ The "Clock Timer": See your time slip by! 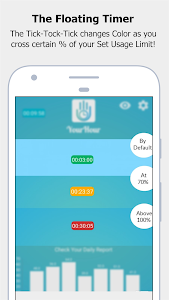 Your Hour app comes with a Floating "Clock Timer" which is one of our helpers to get you out of your addiction. It appears on all your apps so that you can see for yourself the time slipping by. Henceforth, every time you launch the app, we show you a nicely designed ticking "Clock Timer" next to it. You are free to drag and drop it wherever you want. You can enable or disable it from apps. And it would even change color from Green to Amber to Red, as you reach near your Set Usage Limit. We don't block your app notifications or calls like other apps because we want YOU to be the best judge of YOUR time. So we keep you aware at every possible juncture. ★ Tap That App: Just tap it! Here you can see the apps that you have been using all the day long & the time you’ve spent on them, out of your Set Usage Limit. 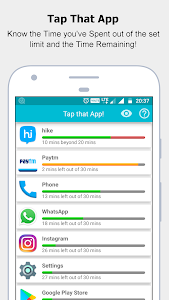 Tap the app to view the App’s Lifeline. 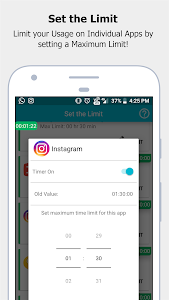 Here you can also customise your usage limit on individual apps in Set the Limit option. 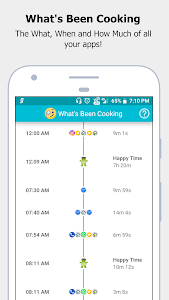 ★ What’s Been Cooking: Your Phone’s Daily Routine! The Timeline is a sequential diary of *What's Been Cooking* the whole day round. It goes on recording the time you launched an app, the time you spent there, the apps you switched over, etc. In short, it is the *WHAT, WHEN and HOW MUCH* of all your apps. However, if you remain fixed to your goal, and keep that screen away for more than 10 minutes, that time will be your *HAPPY TIME*! ★ The Reports: We Remind you! 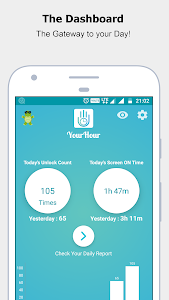 Your Hour app provides its users Daily and Weekly report cards for their app usage. The Daily usage report reviews the usage on individual apps, with app run-time and app launch count for each app separately through a consolidated report notification showing the Top 5 Most Used Apps of the Day. The Weekly usage report will summarize the last 7 days phone usage & unlock count for you. The user can also see how much time he has spent on individual apps & launch count for each day throughout the week. ★ The Widget: Your Hour On Screen! 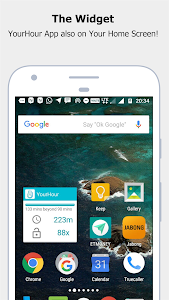 YourHour also provides the user to place the app’s widget on the home screen so that the user can view their usage time, unlock count & set target limit without having to launch the app or even unlock their phone! We would love to hear from you about the features you like the most & other features you want in the future. Your suggestions mean a lot coz we are striving hard to make you live A Healthy Digital Life! Stay Smart & Stay Healthy! * Entirely revamped & an amazing Dashboard for you with all useful features at once place! 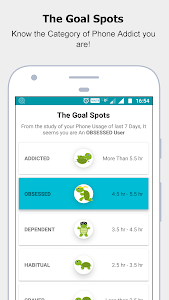 * Now Beat your phone addiction by settings your goals & monitor your usage against the graph! * Get your Daily Dose of Motivation on Dashboard with great positive quotes. * New Real-time timeline graph to monitor your today's progress! * Now you can enjoy an ad-free & seamless experience with upfront price visibility! Similar to "Your Hour - phone addiction tracker and controller"